Amateur Radio operators and Federal government radio stations were recently engaged in a nationwide test of their capability to communicate with each other by HF in the event of an emergency or disaster. The 12-day joint readiness exercise ran from March 27 through April 7, and covered all areas of the country using a digital HF radio system known as Automatic Link Establishment (ALE). This High Frequency Interoperability Exercise 2014 (HFIE-2014) ran concurrently with the federal National Exercise Program (NEP) 2014. ALE is a standardized digital signaling protocol used by each radio service, amateur and government, to establish HF communications between their stations. For the first time, the government regulatory agencies (FCC and NTIA) have authorized these stations to communicate with each other using ALE. HF radio enables long distance communication independent of terrestrial communications infrastructure, Internet, or satellites. To facilitate the communication testing, FEMA secured temporary authority from the National Telecommunications and Information Administration (NTIA) and the FCC. HF radios used by the government stations have the ALE capability built into the hardware, while Amateur Radio operators have implemented the same ALE protocols using their personal computers with ham radio equipment and software. The Special Temporary Authority allowed for on-the-air testing of interoperability between the hardware and software-generated ALE capabilities. The HFIE-2014 is a semi-annual Amateur Radio readiness exercise coordinated by the HFLINK organization and the Global ALE High Frequency Network. It is open to all ALE-capable Amateur Radio stations. Technical and operational guidelines for amateur and federal government stations are available here. As you're reading this the National Hurricane Conference Amateur Radio workshop will have just wrapped up. Held each year in conjunction with the National Hurricane Conference the workshop features speakers on a range of topics related to the Amateur Radio response to hurricanes. This year the workshop, held in Orlando, FL, was kicked off by National Hurricane Center Director Dr. Richard Knabb.Dr. Knabb discussed the importance of Amateur Radio in the mission of the National Hurricane Center. Speakers at this year's workshop included Bob Robichaud, VE1MBP, of the Canadian Hurricane Center, Julio Ripoll, WD4R and John McHugh, K4AG, from WX4NHC, Rob Macedo, KD1CY from VOIP WX Net, Mike Corey, KI1U ARRL Emergency Preparedness Manager, Doug Rehman, K4AC ARRL Southeastern Division Director, and Bobby Graves, KB5HAV from Hurricane Watch Net. The workshop was live streamed. A Q&A session was held at the end with questions coming from in person and online attendees. The link for the archived video will be posted soon. The Large Atlantic Tsunami Exercise (LANTEX) is a yearly tsunami drill that runs on the east coast of Canada, the US and the Caribbean basin, to test the reliability of communication systems and protocols between centers of tsunami alerts and focal points of communications in the event that a tsunami alert is issued. In Puerto Rico, the exercise is executed in conjunction with the Seismic Net of Puerto Rico (RSPR), FEMA, the Puerto Rico Emergency Management Agency (PREMA­AEMEAD) and NOAA. This year the drill was held on March 26, 2014, featuring a choice of two scenarios: an earthquake on the coast of Portugal, or a submarine landslide in the Gulf of Mexico. Puerto Rican agencies chose the Portugal scenario, based on a similar earthquake and tsunami event that occurred in that country in 1755.
performance, and many government, public and private institutions in many cities conducted their own evacuation drills to test their preparedness and ability for citizens to travel safely to their nearest local refuge site. Schools and Senior homes were the most active. 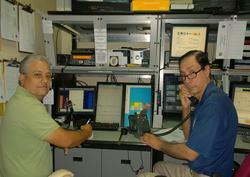 Since 2010, Amateur Radio has played a role in these exercises with PREMA at an island­wide level. The Cuerpo Voluntarios Radioaficionados ­ (KP4CVR) has been the main player in these drills, and has been activated from the 12 PREMA zones. Each zone facility is equipped with a Kenwood TS­2000 transceiver, made possible by a federal grant. The point of contact was on 147.210 MHz, the KP4CAR repeater, located in Cerro Puntas, in the city of Jayuya, the highest point of the island, and has sufficient emergency power to stay on the air for a few days. The main responsibility of radio amateurs was to gather reports from amateur stations around the island of how they were notified by the EAS alert: broadcast radio, TV, Cable or by other means such as the sounding of sirens. The information gathered is then delivered to PREMA's Headquarters for post-exercise evaluations and planning. At the municipal level, the Bayman Radio Club, an ARRL Affiliated Club, assisted the EMA of the northern city of Dorado, which was certified recently as Tsunami Ready. Organized by Jimmy Drowne, KP3BR, operators volunteered to assist with any kind of communications problem during the exercise. Drowne's 447.225 MHz repeater and 146.430 MHz simplex were used. The group was commended for their support of the drill. The Tennessee Emergency Management Agency (TEMA) is sponsoring one of the country's premier events for communications training. The event brings together professionals and volunteers from across the state to work together for training and realistic exercises. Participants come from all sectors of radio communications: Amateur Radio, MARS and professional. The only prerequisite to participation is an interest and a willingness to work as a team member. Participants learn new skills and get a chance to develop relationships with other volunteers and professionals. Licensees with little experience in emergency communications or who have not attended prior events are teamed up with more experienced operators for training and practice. The exercise will be held at the Tennessee Fire and Codes Enforcement Academy in Bell Buckle, Tennessee, about an hour's drive south of Nashville. Activities begin at 1:00 PM Thursday, May 1 with command vehicle deployment having started at about 9:00 AM. Entities participating will include a wide assortment of agencies, organizations and volunteers including TEMA personnel, National and/or State Guard, State Health, Vanderbilt LifeFlight, ARES, MARS, Winlink developers, Bridgestone Emergency Response Team (BERT), FedEx, Tennessee Baptist Disaster Relief, Red Cross, and others. · Working in the field with drop kits, and command vehicles. · Setting up HF antennas in the field. · Use of Incident Command System (ICS) organization and procedures. I attended the 16th annual Communications Academy in Seattle, Washington, March 22-23, 2014, to acquire a better understanding of the direction of public service/Amateur Radio communications technology. I am in the process of rebuilding the Sunset Empire Amateur Radio Club repeater system and I wanted to connect with those who have done similar projects. The Saturday presentation by Duane Mariotti, WB9RER, "EmCom: Time for Change or Obsolescence" was outstanding. Mariotti's presentation can be condensed into his talking point: "As technology has changed, Amateur Radio emergency communications must also change to remain of value." His presentation related to his experience in emergency and disaster response communications and as volunteer coordinator for a twenty hospital Amateur Radio network of over 15 repeaters. One of the Sunday presentations by Tom Cox, VE6TOX, "The Last Two Feet," concerned one of the significant problems in EOCs and command centers: connecting within their own organizations or staffing elements in the same room. His presentation focused on how to connect with various responders and supporting agencies. There were a number of public discussion threads, sidebars, and table top discussions related to ARES and the ICS training. A recurring issue was the training requirements of FEMA and other agencies. One discussion point was "what is truly necessary for a volunteer group?" Nearly all agreed not every volunteer needs the entire training model to be an effective volunteer if they are not in the EOC. Another issue was the lack of volunteers who have the time to take on many of the training requirements. Another discussion issue was how to effectively engage the services of those amateurs who do not participate in exercises and training, but come out for real incidents to serve. The Global Amateur Radio Emergency Communications (GAREC) Conference will return to Huntsville, Alabama, August 14 and 15, 2014. The conference will be held in conjunction with the 2014 ARRL Southeastern Division Convention/Annual Huntsville Hamfest, which will be held on Saturday, August 16 and Sunday, August 17, at the Von Braun Convention Center in Huntsville. The 2014 GAREC conference will focus on the application of advanced technologies in emergency and disaster response communications. Experts will meet and discuss local, regional and global activities, operations, lessons learned and explore better, new ways of coordination and communications in times of emergency. All Amateur Radio operators and professionals alike are invited to attend! The 2007 GAREC was held in Huntsville. Radio amateurs from all over the world attended both the conference and the Huntsville Hamfest. Many bonds were formed and communications on a regional and global level were discussed. For speaker and presenter information, contact Hans Zimmermann, F5VKP/HB9AQS, IARU International Coordinator for Emergency Communications. For registration and all GAREC 2014 information, click here. While REACT has been associated primarily with Citizens Band in the past, the organization has widened its focus to embrace amateur and other services. ARRL and REACT share common goals in terms of emergency communication. The primary mission of REACT is "to provide public safety communications to individuals, organizations, and government agencies to save lives, prevent injuries, and give assistance wherever and whenever needed." The memorandum of understanding calls on the two organizations to "cooperate and utilize their resources from time to time to optimum mutual benefit to both parties." Among specific principles, the agreement involves cooperation during emergencies and disaster relief and the elimination of "duplicative or technically inferior service" during such responses. "The parties will generally encourage ongoing liaison with each other and urge members of both organizations to develop increasingly effective communications and cooperation," the agreement states. In what may be the first public service event of 2014 in New England, a team of 16 Amateur Radio volunteers endured near-freezing temperatures and a cold north wind to support the Ashland Marathon Park Prep, a 13 mile half marathon race, on March 16, 2014. Just one month before the Boston Marathon, nearly 700 runners lined up at the original marathon starting line (changed in the early 1900's to Hopkinton) for a brisk and challenging run. Led by David Wolfe, KG1H and Mark Richards, K1MGY, and under the auspices of the Minuteman Repeater Association, Amateur Radio provided logistics communications for route support, maintained liaison with and provided information to the event managers, established and maintained a direct link with EMS, and performed SAG and SWEEP functions along the entire route. Several runners took advantage of the non-medical transport made available through the generosity of hams. These SAG units consisted of a driver and a navigator/assistant. While the assistant focused on location awareness, the driver remained "heads-up" at all times along the sometimes-crowded course. SAG drivers were recruited based upon prior experience. A set of reporting protocols for transport and a detailed event log offered reasonable homage to any liability concerns. Nine operators supported the St. Patrick's Day activities in Toronto, Ohio, on March 15, 2014. These annual events include a Fun Run, a 5K Bicycle Ride and a 5K Run. Operators from the Jefferson County ARES group as well as hams from the surrounding area worked together for the overall success of the operation. Communications included service as "eyes and ears" with operators reporting locations and numbers of the first male and female runners in each group. All runners were advised to locate a radio operator if there was a problem or injury. In addition to the operators along the course, APRS tracking was also employed in the lead vehicle (a police cruiser) and the SAG vehicle, an off road utility vehicle. The Net Control station was setup in the EMS facility near the start/finish line area. The APRS tracking receive station was established in the Command Center Room with the NCS and race officials. APRS data was received live and displayed on a projected map of the race area. This screen quickly became a point of interest for many involved in managing the race. The ability for officials to visualize the locations of the runners made it easier to monitor the progress of the race. Equipment used along the course consisted of 2 Meter HTs or mobile rigs operating on 147.48 MHz simplex. The simplex mode was chosen for several reasons: the terrain and close proximity did not necessitate the use of a repeater, and it is always good practice to use simplex as a viable means of communications should a repeater go down. Hospitals are currently facing budget cuts, and are reducing staff in departments across organizations to a minimum. This environment will put pressure on all aspects of healthcare delivery, including communications resources and back-up systems. As such, hospitals, as with many other sectors of emergency management and public services will turn more to volunteers trained as almost paraprofessionals to perform needed services, and that presents opportunities for us as ARES members and operators. Make it a point to approach hospitals in your area with your service capabilities. Hospitals are organized by department: the ER, ICU, OR, the medical/surgical floors, radiology (both interventional and diagnostic), the pharmacy, and laboratories for chemistry, hematology, pathology, and microbiology. All of these departments work closely together to effect safe and efficient medical care of the patient, and they can't fulfill that function without fast, error-free accurate and effective communications. At the very heart of a hospital is the critical need for communications between the bedside Registered Nurse and the doctor, especially in departments such as the Intensive Care Unit (ICU). As a critical-care certified RN, I have worked on the medical ICU at a 400-bed public hospital for nine years, where communication must be clear and fast, or patients may die. We rely on the telephone system, a voice/name recognition paging/two-way system, and a good old fax machine. In recent months and years, we have relied more on computer to computer communications for lab results, reports, and medication and other orders. These systems have all failed at some point, and in some cases we have relied on, believe it or not, paper slips carried between departments and personnel by runners. Recently, a California group, the Bishop Amateur Radio Club (BARC), provided support to a statewide emergency medical exercise: The Statewide Medical and Health Exercise Program, an effort to discover capabilities and vulnerabilities among partners in the Public Health and Medical Services Emergency Support Function #8 (ESF#8) of California. Exercise participants included health departments, emergency medical service agencies, acute care hospitals/facilities, community clinics, emergency management, medical examiners/coroners, law enforcement, and fire services. Mammoth Lakes police officer Paul Dostie, KK6BAF, reported that for last November's exercise a total communications breakdown was simulated (with outages of phone, cellular, Internet, VHF and UHF repeater systems). BARC members set up HF stations with NVIS antennas at the three hospitals in Inyo and Mono Counties, and established solid communications among the three hospitals and the Inland Counties Emergency Medical Agency (ICEMA) in San Bernardino, California. ICEMA has an HF station with a 40-meter beam antenna at Patton State Hospital in San Bernardino. There are many examples of Amateur Radio use for emergency back-up support for healthcare facilities. Information must be conveyed with 100% accuracy, or patient safety is put at risk. Some protocols to follow as communicators include: re-transmitting (reading) orders and labs back to confirm accuracy. Confirm that you are talking about the correct patient. Orders for medications especially must be confirmed by reading them back (RBO) as an accuracy check. Medication errors are critical patient safety issues. One of the 2014 Hospital National Patient Safety Goals promulgated by the Joint Commission on accreditation of health care organizations is the following: "Get important test results to the right staff person on time," a major communications issue. Lab results must be conveyed accurately as one that is misstated can result in a wrong medication given, or blood transfusion being unnecessarily given, or not given when the patient may actually need it. Use error-correcting digital modes to further assure accuracy: packet radio, for example. This mode also has the benefit of some degree of privacy of communications since the public is less likely to have packet radio equipment to eavesdrop. Also, in that regard, lower your power output to the least level practicable, and choose lesser-used frequencies. Copyright © 2014 American Radio Relay League, Incorporated. Use and distribution of this publication, or any portion thereof, is permitted for non-commercial or educational purposes, with attribution. All other purposes require written permission.